In 925 Tomislav unified the inland plain and the coast into Croatia. In 1102 King Petar Svacic died and Croatia became a vassal state of Hungary. In 1180 Bosnia became an independent state under Kulan Ban (King). The Charter which attested attributes of independence was signed by Kulan Ban and Krvas, the ruler of Dubrovnik in 1189. Kulan Ban ruled until 1204. The stamp was issued in 1989 to mark the 800th anniversary of the signing of the Charter of Kulan Ban. 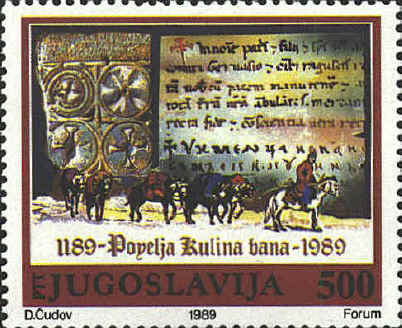 In 1189 Kulin Ban (1163-1204) issued the first written Bosnian document, a trade agreement between Bosnia and the republic of Dubrovnik, known as Povelja Kulin Ban, the “Charter of Kulin Ban.” In 1995 the Republic of Bosnia and Herzegovina issued a stamp which shows a small part of the Povelja, written in Cyrillic. The translation which follows was done by W. Browne. In the name of the Father and of the Son and of the Holy Ghost. I, Kulin, ban of Bosnia, swear to be a true friend to you, o prince Kr'vash, and to all Dubrovnik citizens from now on and forever, and to keep true peace with you, and true faith, as long as I am alive. All Dubrovnik people who go through my domain trading, wherever anyone wants to move or wherever anyone passes, I will in true faith and with a true heart keep without any damage, unless someone of his own will gives me a gift, and let there be no violence against them by my officers, and as long as they are in my lands I will give them advice and help as I would to myself, as much as I am able, without any evil intention, so help me God and this holy Gospel. I Radoje the ban's clerk wrote this document by the command of the ban, one thousand and one hundred and eighty and nine years from the birth of Christ, the month of August, the twenty-ninth day, [the day of] the beheading of John the Baptist.